In response to numerous customer requests, MattingExperts.com has added snow and ice melting mats to their online store. Large corporate customers and small business owners alike realize the need to keep entrances free of the slippery mess of winter’s snow and ice. Employers are keeping their maintenance staff to record low numbers in response to the weakened economy and in addition to other work-saving measures, hard working floor mats are in huge demand. Instead of either hiring additional staff to keep traditional floor mats and entrances from being lawsuit-inducing ice rinks, why not make a one-time investment in a heated electric mat? Large corporate customers and small business owners alike realize the need to keep entrances free of the slippery mess of winter’s snow and ice. The heated entry runners offered through MattingExperts.com are made by a company called HeatTrak. HeatTrak has been in business since 2004 with corporate offices in Paterson, New Jersey. Popularity for their products has grown out of the many attributes they offer. For one, the mats are completely portable and are made to be laid upon existing surfaces. 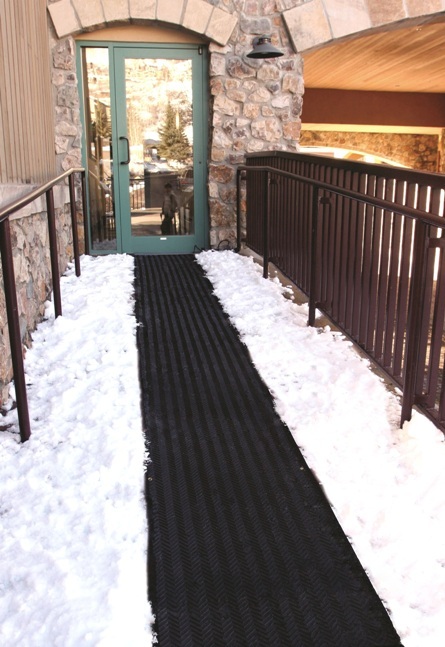 Using a heated entry mat will eliminate the need to use salt at doorways leading to a much cleaner building interior and less work for cleaning staff. Made of a similar rubber to what is used in automobile tires, customers find they stand up really well to all kinds and amounts of traffic. The most popular of their mats on the site is called the Industrial Heating Walkway Mat. Essentially this is a rubber runner in various sizes that has a chevron grooved face pattern. Customers have a choice of 120v or 240v power supply. Each mat also has metal grommets all around the mat so they can be secured to most any surface. The manufacturer is extremely accommodating to special design needs and will have one of their engineers speak directly to prospective customers to ensure their mats are just as they need. Also on the MattingExperts site are HeatTrak’s Industrial Heating Stair Mats. These are made from the same material as the Walkway mats only in common stair tread sizes. Customers chose how many steps they want treads for and the manufacturer will put the electrical cords on whichever side is requested. A full range of accessories are available to enhance these amazing mats’ performance. Snow and temperature sensors are offered as one unit or as standalone devices. For residential customers there is a heated door mat that is charcoal grey carpet material.